​An eighth-century biography of Bishop Gregory I of Rome (540-604) attests that one day, before he was bishop, Gregory saw boys “with fair complexions, handsome faces, and lovely hair” being sold in the slave market in Rome.Inquiring about their identity, he was told that they were angli (Anglo or English).Responding with a play on words, he declared, “they have the face of angels [angeli] and such men should be fellow-heirs with the angels in heaven.”Though scholars regard this story as a legend, around 596, several years after becoming bishop of Rome, Gregory sent Augustine of Canterbury (d. 604) and a group of about forty monks on a mission to evangelize the English—the first cross-cultural mission ever initiated by a Roman bishop. In this paper, my aim is to first present Gregory the Great as a mission-minded bishop and sender of missionaries. Next, I will describe the mission to England—the hardships, outcomes, and approaches to mission. Finally, as we consider mission amid global crises in the 21stcentury, what do we learn from Gregory’s monastic theology of mission, his commitment to the mission, and his care for the missionaries? This story is also recounted by Bede in Ecclesiastical History 2.1. Bede in Ecclesiastical History 2.1; cf. Mayr-Harting, Coming of Christianity, 57-58. Playing off some treasured Protestant language, Greg Peters’ new book is entitled The Monkhood of All Believers. Continuing his monastic scholarship, which includes works such as The Story of Monasticism (2015) and Reforming the Monastery (2013), Peters argues that though every Christian is not a monk in the institutional sense, monastic values are central to the Christian experience. Borrowing Martin Luther’s words, a Christian can be a monk but not a monk. In the first part of his work, Peters thoroughly defines monasticism (chap. 1), narrates monastic history (chap. 2), and then discusses interiorized monasticism—the focus of every believer to have single-minded devotion to God (chap. 3). In part two, he spells out the meaning and practice of asceticism (chap. 4) and then shows that the notion of the priesthood of all believers is celebrated by Protestants and Catholics alike (chap. 5). In the final section, the author summarizes his case for monastic living for all Christians (chap. 6) and then discusses vocation in general and monastic vocation in particular (chap. 7). I am a fan of Greg Peters’ scholarship and I learned much in this new work from his careful interaction with a breadth of sources—from early Christian monks, Russian Orthodox thinkers, Protestant Reformers, and Anglican sources. Because of this engagement, Peters successfully shows that the monastic impulse is present across Christian traditions. My views on Christian monasticism’s fourth-century origins were challenged by Peters’ claims—via Augustine and Cassian—that monasticism can be traced to the habits of the earliest Christians in Acts 2 and 4. By arguing for first-century monastic Christianity, he does support his overall claim about the monastic-ascetic nature of Christianity—single-minded devotion to God. What’s a review without some critiques? First, though Peters’ research is thorough, his claims for the monkhood of all believers seem to rest on the thought of selected theologians (i.e. Paul Evdokimov and Raimon Panikkar in chap. 3) rather than the broader consensus of monastic history and thought. Second, the “I am a monk but not a monk” dichotomy began to unravel for me as I continued through the book. Indeed, monastic values and practices such as prayer, Scripture reading, and work ought to shape Christian spirituality for monks and non-monks alike. This is what Dennis Okholm was after in his work Monk Habits for Everyday Life (2007). While Peters aims to go farther than Okholm, calling for all Christians to be monks, in the end I didn’t see Peters’ work being terribly distinct from Okholm’s—everyday Christians can emulate monastic living to some degree. In short, while all Christians may follow the spiritual examples of monks and emulate some practices, I don’t think that makes all Christians monks. That said, as a non-monk who admires monastic spirituality and strives to apply some monk habits in my faith walk, I highly value this new book and Peters’ efforts to probe ancient and modern monastic thinking. I hope to see Greg Peters soon and talk about some of this more. ​Andrew F. Walls. Crossing Cultural Frontiers: Studies in the History of World Christianity. Maryknoll: Orbis, 2017. xii + 284 pp. $32 [note: this was published in Themelios 43:1 (2018), 167-168]. Crossing Cultural Frontiers is the most recent work from Andrew Walls, an eminent scholar of history of Christian mission and world Christianity. Previously a missionary to Sierra Leone, Walls’ academic career has included professorships at the University of Edinburgh, Liverpool Hope University, and Afroki-Christaller Institute (Ghana). The present work is a “best of Walls” compilation comprising works published in other journals and books. In fact, it is the third such “best of” compendium. The previous two include The Missionary Movement in Christian History (1996) and The Cross-Cultural Process in Christian History (2002). The essays in the volume are grouped into three sections. In the first, “The Transmission of Christian Faith,” Walls argues for the multi-cultural and global nature of early Christianity (chap. 1), presents Origen as the father of mission studies (chap. 2), and discusses worldview, including how much of a believer’s culture and previous religion stay with them at Christian conversion (chap. 3). By juxtaposing Adamic (forced out) vs. Abrahamic (voluntary going) migration, Walls offers a theology of migration (chap. 4). Finally, he argues that studying Christian history is a cross-cultural exercise (chap. 5). In part two, “Africa in Christian Thought and History,” Walls explores world Christianity in the region of the world that he knows best. He explores a history of African discipleship through suffering (chap. 6), the eighteenth-century “Christian experiment” of the Sierra Leone colony (chap. 7), and nineteenth-century attempts to cultivate Christianity in the vernacular in West Africa (chap. 8). He completes the section by showing how African traditional religions began to be studied (chap. 9), and how the Ghanian scholar Kwame Bediako exemplified African Christian scholarship (chap. 10). In the final part, Walls focuses on “The Missionary Movement and the West.” In this he dedicates chapters to how western missions and missionaries are portrayed in English literature (chap. 11), John and Charles Wesley’s theology and practice of mission (chap. 12), and the legacy of mission literature—particularly Jonathan Edwards’ Life of Brainerd (chap. 13). In the remaining chapters, Walls discusses an African (Tiyo Sago) and Indian (Behari Lal Singh) scholar living in Britain and being exemplars of world Christianity (chap. 14), western missionaries in China committed to vernacular and indigenous Christianity (chap. 15), and the work of Harold Turner who sought to grasp indigenous Christianity with an eye toward traditional religions (chap. 16). In a brief concluding chapter, Walls reflects on the vocation of missiology. As only Walls can put it, he writes, “Missiologists are the magpies of the academic world; they invade the scholarly territory of their neighbors and steal their topics . . . the biblical field, the theological field, the historical field, and the practical field in the name of the study of mission . . . This also makes them academic subversives, upsetting harmony by raising new issues; introducing new perspectives and new data; identifying new questions and problems within established fields” (p. 259). There is much to appreciate in this collection of Walls’ essays and I will highlight two areas. First, Walls’ lifelong exploration of indigenous Christianity—the gospel at home in every culture—is well teased out in this volume. Beginning with the question, what does it mean to be a Greek (or African or other) Christian?, he illustrates this reality through a survey of the early church in general, and individuals such as Antony, Origen, Kwame Bediako, Tiyo Sago, and Behari Lal Singh (chaps. 1-2, 10, 14). He explores the eighteenth and nineteenth-century vernacular translation work of missionaries in West Africa and also China, including the struggles and failures to achieve local Christianity (chaps. 8, 15). In his study of conversion (chap. 3) and Harold Turner’s study of pre-Christian religions (chap. 16), he wrestles with the authentic cultural and religious identity of local Christians. In short, this volume offers a rich collection of case studies for indigenous and world Christianity. Second, Walls’ discussion on theology of migration (chap. 4) contained fresh insights. His paradigm of forced (Adamic) vs. voluntary (Abrahamic) migration sets a framework for peoples on the move in Scripture and throughout history. Further, his emphasis on Greater European Migration from the fifteenth to twentieth centuries is important because it offers a context for understanding colonialism and the founding of new nations, while also offering context for the reverse migration to Europe and the West which has taken place in the twentieth and twenty-first centuries. These historical and theological reflections are needed by the church in the West today. To these points of appreciation, I raise two questions for critique. First, I applaud Walls for highlighting Origen as the father of mission studies (chap. 2). Origen showed how one could be thoroughly Christian and thoroughly Greek and thoroughly Egyptian and he praised the work of itinerant evangelists. However, can we call someone the father of mission studies who lacked personal and practical experience in cross-cultural mission engagement? Second, Walls has helped the reader understand the identity of a Christian believer situated in a local culture with a pre-Christian past (chap. 3). Conversion is a messy process as the gospel makes its home in a given culture. However, I think Walls could have given more space to discussing how and when local Christianity turns into idolatry or syncretism. To borrow from Walls, what does it look like for the gospel to be a pilgrim message (exhorting, critiquing, being prophetic) within a given context? ​All said, it was a pleasure to sit with Professor Walls on this journey. His call to do church history as a global, cross-cultural exercise (chap. 5) has certainly shaped this reader’s academic and professional path. In recent years, global theologians of mission have emphasized a posture of mission from below—missional engagement from a place of weakness and vulnerability. In part a reaction to the mistakes of Christendom and Christian mission’s alliance with political and economic power, mission from below aims to recover first-century mission that emulates the way of Christ and the apostles. This approach to mission is also relevant in contexts today where Christian freedom (for worship and witness) is limited by tyrannical or resistant governments. As we strive to be as wise as serpents and gentle as doves in contemporary mission, it seems fruitful to explore the theology of mission of a medieval Italian mendicant monk who ministered to Muslims during the Crusades. 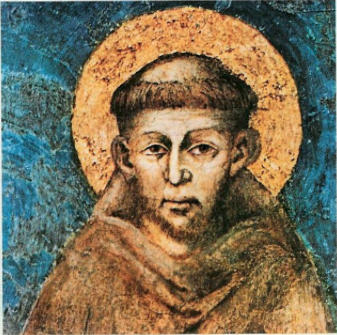 In this article, following a brief narrative of Francis of Assisi’s (1181–1226) life and journey in mission, I will focus on Francis’s Christology and how that shaped his approach to mission among Muslims and others. Finally, I will conclude with some reflections for what the church on mission today might gain from Francis. I’m grateful for Ben Myers’ new little book The Apostles' Creed: A Guide to the Ancient Catechism. This is the first title in Lexham’s Christian Essential Series that will include works on the Lord’s Prayer, Ten Commandments, baptism, the Lord’s Supper and others. Though Myers’ book is a bit more brief, it does resemble the aims of Michael Bird’s What Christians Ought to Believe (2016). These books evidence an encouraging trend that the contemporary church is seeking wisdom for faith and practice from the ancient church. May they be widely read and deeply digested. Though Myers’ book is just 133 pages and quite readable in one sitting, I chose to read it slowly (usually after morning devotions and prayers) following the book’s structure: 22 chapters organized by the three major articles on Father, Son, and Holy Spirit. I think this book would best be read over 22 days of devotions or 22 weeks as a small group Bible study or Sunday School class for adults and youth alike. It would also be a great resource for discipleship with a new believer. Breaking down each line of the creed, Myers’ engages Scripture and also leans on the thought of church fathers such as Ireneaus, Origen, Gregory of Nyssa, and Augustine. We grasp how the creed was articulated in the face of challenges from Gnosticism, Marcionism, Novatianism, and others. I think what I appreciated most was Myer’s ability to discuss the ancient creed with 21st century cultural concerns in mind: individualism, gender identity, and the material world. Myers’ presentation of the creed—and the gospel—was winsome, dogmatic, and relevant. Originally given at the 2016 Evangelical Theological Society annual meeting, my paper, "Ignatius of Antioch's Trinitarian Foundation for Church Unity and Obeying Spiritual Leaders," has now been published in the Winter 2018 edition of Fides et Humilitas. While on the road to stand trial and face martyrdom in Rome, Bishop Ignatius of Antioch (d. ca. 110) authored seven letters—five to Asian churches, one to Bishop Polycarp of Smyrna, and one to the church at Rome. Providing rich insight into the issues of the second-century church in Asia, the letters also reveal a good bit of Ignatius’ theology, including his thoughts on ecclesiology, martyrdom, Judaism, heresy, and the Trinity. In this paper, I suggest that Ignatius’ pleas for church unity and obedience to the bishop—arguably the strongest themes in his letters—were founded on his understanding of the Trinity and that his ecclesiology depended on this developing Trinitarian thought. 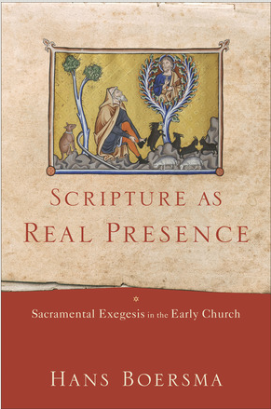 Scripture as Real Presence: Sacramental Exegesis in the Early Church. By Hans Boersma. Grand Rapids: Baker Academic, 2017, xix + 316 pp., $39.99, hardcover. [originally published in JETS 60:4 (2017)]. Scripture as Real Presence is the most recent book from prolific author and Regent College theology professor, Hans Boersma. A Reformed theologian, Boersma has also authored other works on sacramental theology, including Sacramental Preaching (2016), The Oxford Handbook of Sacramental Theology (edited with Matthew Leavering, 2015), Embodiment and Virtue in Gregory of Nyssa (2015), and Nouvelle Theologie and Sacramental Ontology (2013) among others. While building on these previous works, Boersma’s book also resembles the general aims of at least three other recent works: (1) Matthew Leavering’s Participatory Biblical Exegesis (2008), which navigates theological and historical interpretation of Scripture; (2) Andrew Louth’s Discerning the Mystery (2007), an apologetic for modern allegorical reading of Scripture; and (3) Frances Young’s Biblical Exegesis and the Formation of Christian Culture (1997), which aims to refresh the categories of patristic exegesis. Continuing the legacy of twentieth century scholars Henri de Lubac and Jean Daniélou, Boersma’s stated aim is one of ressourcement (p. 273)—to present and evaluate the sacramental reading of Scripture celebrated by the church fathers. Pushing back against modern historical approaches in biblical studies, Boersma defends this spiritual, theological interpretation of Scripture, which he defines as “simply a reading of Scripture as Scripture, that is to say, as the book of the church that is meant as a sacramental guide on the journey of salvation” (p. xii). In an introductory first chapter, the author attempts to guide the reader into hearts and minds of the church fathers, presenting their questions and concerns about Scripture. Instead of situating the Bible in Christian worship as Word and Sacrament, Boersma prefers to present the Word as Sacrament. Though human authors conveyed the words of Scripture, the Bible is a divine book that should be read in light of the divine economy. It should be read in light of Christ and the rule of faith. It should be interpreted for “a certain purpose, a particular aim—eternal life in the Triune God” (p. 159). In the chapters that follow (chaps. 2-10), the author discusses nine aspects or values for early Christian sacramental reading of Scripture. In chapter 2 (“Literal Reading”), Boersma shows that while fathers such as Gregory of Nyssa and Augustine valued a surface reading of Scripture, their understanding of literal is quite different than how we conceive of it today. By reading Genesis 18 (Abraham’s three visitors at the Oak of Mamre) through the eyes of Origen and Chrysostom, Boersma argues in chapter 3 for a “hospitable reading” of Scripture. He writes, “Reading Scripture is like hosting a divine visitor . . . when we interpret the Scriptures, we are in the position of Abraham: we are called to show hospitality to God as he graciously comes to us through the pages of the Bible” (p. 56). In chapter 4 (“Other Reading”), the author offers a basic presentation of allegory, affirming scholarly consensus which no longer holds to a strict dichotomony between Alexandrian and Antiochene schools of interpretation. In chapter 5 (“Incarnational Reading”), using the case study of Origen’s homilies on Joshua, Boersma argues that the church fathers saw the incarnation applied not only in the person of Christ and in the written Word of God but also in the life of the church. Chapter 6 (“Harmonious Reading”) explores how the fathers thought about the essence of music and how the Psalms brought healing, harmony, and unity to the body of Christ. In chapter 7 (“Doctrinal Reading”), Boersma discusses how the fathers understood Wisdom (Prov 8:22-25) and combatted an Arian reading of this text through a sacramental approach. In chapter 8 (“Nuptial Reading), he argues that Song of Songs was largely interpreted sacramentally (pertaining to the church and the soul) in the patristic period. In chapter 9 (“Prophetic Reading”), Boersma presents the fathers’ Christological readings on the Servant Songs of Isaiah, asserting that prophecy for the early church was “not only a fore-telling of future events” but a “forth-telling of present realities” (p. 247). Finally, in chapter 10 (“Beatific Reading”), the only portion of the book where the New Testament is emphasized, Boersma summarizes the fathers’ spiritual reading of the Sermon on the Mount. The purpose of the beatitudes is to “participate in [the] happiness of God” (p. 272). This book has a number of strengths. First, Boersma does a very thorough job of engaging the primary sources. Though he does not exhaust the corpus of patristic writings, his chosen case studies are strong and representative enough to make a compelling argument. Second, and related, the author succeeds in helping the modern theology student enter into the thought and church world of the fathers. By sketching out background details on subjects like philosophy and music, the reader is able to put on the lenses of Origen, Gregory of Nyssa, Augustine, and others and begin a sympathetic reading of the fathers. In terms of ressourcement, Boersma makes a winsome case for reading Scripture today in a sacramental manner. I only have two quibbles that are not content related. In terms of overall flow and structure, the book lacked cohesiveness between chapters. Church fathers, other scholars, and ideas are introduced again and again as if we had not read the preceding chapters. Because much of this book had already been published in other forms, more effort could have been made to bring this work together into one organic whole. Second, at points, the author seems unnecessarily critical of contemporary Reformed Protestants for failing to grasp patristic readings of Scripture. While his presentation of patristic sacramental exegesis was winsome, his invitation for modern Protestants to participate in this approach to reading the fathers and Scripture could have also been more welcoming. ​In sum, Boersma’s book is accessible and thorough and would serve as a good resource for a seminary level course on patristic exegesis, which is apparently where the book was in part nurtured and developed.